advanced- no maual motor start. My 2 p3a's & 1 p3p have recently not been able to manually start the motors. All 3 will still fly using "auto take off". Have tried numerous app downloads and firmware upgrades and nothing changes. Posted on phantom 3 help and numerous replies can not solve the problem. Has anyone else seen this before? The good part is I can still fly using Auto Takeoff. What all did you do to solve your problem? List them here. I seem to recall someone had that issue and solved it with a RC calibration. Is that one of the things you've tried? It seems like a long shot since you said multiple P3s, but I thought I'd mention it in case you're using a single RC. That too flashed my mind but he has 3 P3 aircrafts and three RCs. That's why I asked him to list the steps he took to resolve his problem. I'm feel silly for not immediately thinking of that myself. I use a custom mode, so I have non standard stick positions for motor start. It should have crossed my mind for sure, so thanks for bringing it up. If I remember correctly, that setting is stored in the P3 itself. I'm thinking that he would have had to change the mode setting on each of his P3s if they all have the same issue noted. Calibrated RC & did firmware upgrade. calibrated ac and did twice because did not hit button during timer count down. got new ipad mini 4 for better dji go downloads. reviewed video on how to start motors. Still have to use auto take off to fly. Could you tell me how to change that mode on the aircraft. Its a setting in the app. The setting however is saved in the AC from what I recall. I'm on the road right now, so don't have access to the app. Hopefully someone will chime in with the path to that setting or you can just search for it in the mean time. A search for "custom modes" should bring up a few hundred posts. The default is Mode 2. I changed mine because my brain wants the P3 to go UP when I pull the stick BACK. Because I changed mine to a custom mode, I need to do a different stick combination to start my motors. Like I said earlier, its a long shot because I think you would have had to make this change on all three of your P3s to be having the issue you described. All 3 phantoms show controller settings as mode 2. Still no resolution. Curious, but with this problem does the CSC still stop the motors? Yes, the CSC still works to stop the motors but once stopped, they will not restart unless I use auto take off again. Okay, I did some playing around and this should fix it. For convenience, you can do this in your home vs outside. Connect the RC to the device that has the Go App, open the app, turn on the RC, with NO PROPS ON, turn on the Phantom AC. Next step is to select setting, then stick mode, see pic. Select mode 2, press apply. See pic. Exit setting and test for motor start. If I am correct you will have observed a selected mode before you changed back to mode 2. It would have looked like this. 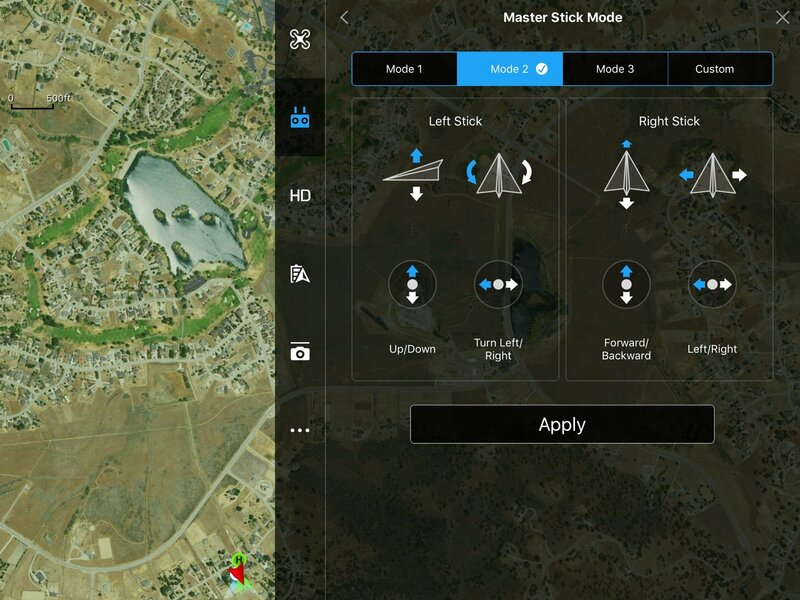 Can not get to "Master Stick Mode" on my tablet. I will try on my ipad mini and see if that will work. Got to master stick mode on ipad mini and nothing happens when I press "Apply". It shows a check mark on mode 2 and still no motor start. Hmmm, I still,think this is a stick mode issue, but it is most certainly odd. If your up for another attempt I would consider trying this. 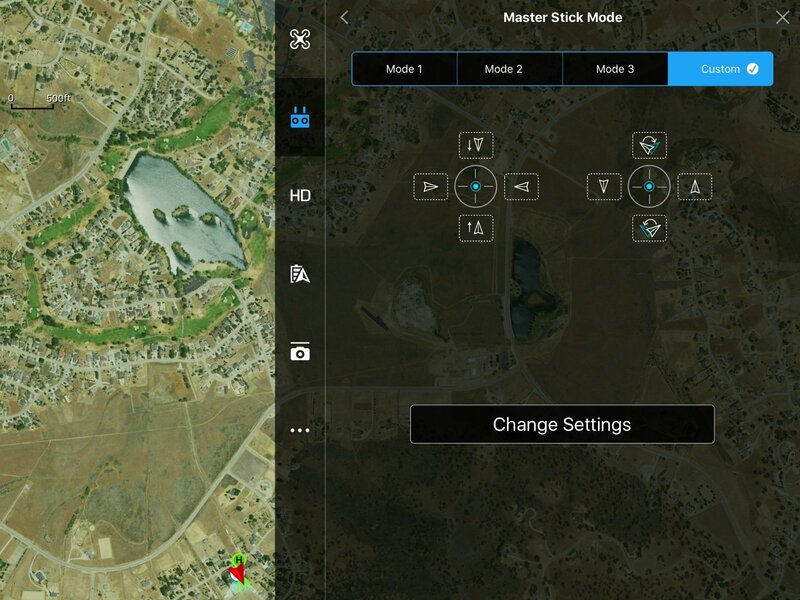 With all items again on, go back to the stick mode and build a new custom mode and match the actions from mode 2, then apply. Test for motor control and if this works you can try switching back to the normal mode 2. Applied custom settings and nothing happened. Changed back to mode 2 and again nothing happened. All items were on and built custom mode matching mode 2. Okay, the last effort I can think that may help is a remote control calibration. I didn't see this had already been done, but it won't hurt anything. If this doesn't work than you may have to elevate the issue with DJI repair.